Liberal arts learning at Trinity extends well beyond the traditional classroom. It encourages and builds on countless interactions and associations with individuals, businesses and volunteer organizations alike. Whether for an individual interested in using the library or attending a public lecture or concert or for an employer exploring internship or employment options, this page of quick links has been prepared for the convenience of all our various community friends. 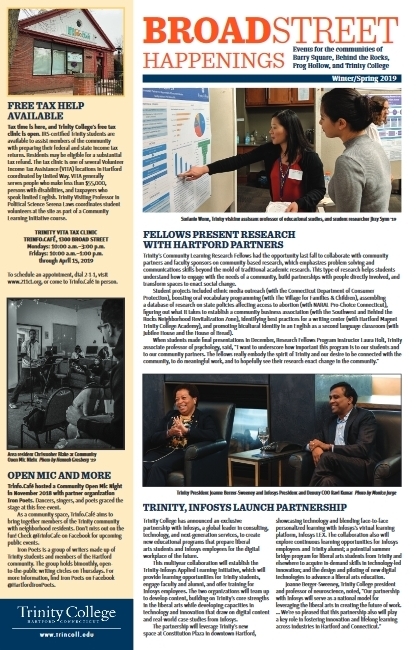 Click the image above to read the Winter/Spring 2019 issue of Broad Street Happenings.